Richard Des Jardins (b. 1948) studied Fine Arts at Universite de Quebec and Ecole Des Beaux Arts in Quebec, Canada. Upon completing his studies, he continued with his art, but also went on to have careers in visual merchandising for home furnishings in Montreal, floral design and set styling in New York City, as well as a successful interior design practice. He has shared his aesthetic sense of design and color and his knowledge of spatial concepts with interior design students at the Fashion Institute of Technology over the last 30 years. In 2000 he returned to further exploration of space through paintings and mixed media art work. 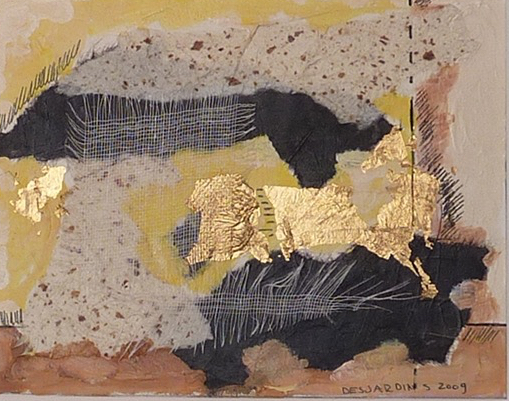 In the collection exhibited, his sense of space through mixed media is further enhanced with gold and silver leaf. The reflection off of these materials creates a movement as the eye moves in exploring the collage and engages one in the spatial experience. 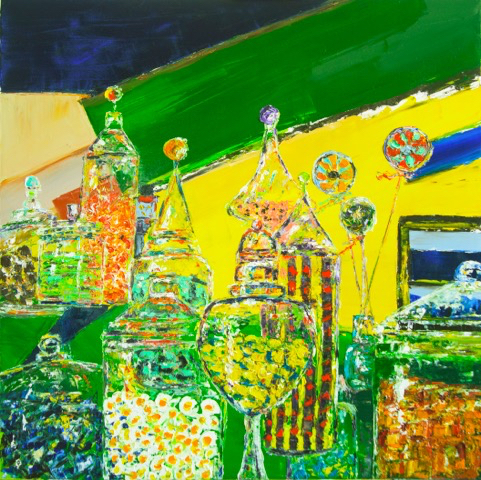 Assorted gestures in Kat Evans’ abstracts vibrate with color. Moods flicker between bold brush strokes and layered textures. 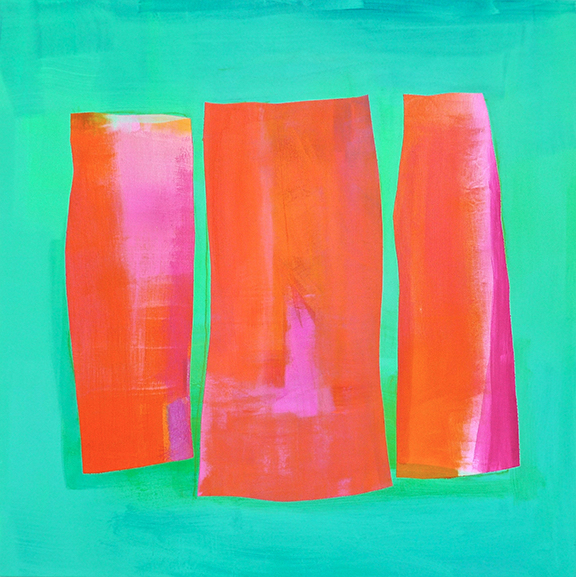 Integral to her work is the interaction of color and its ability to evoke an emotional response. The disciplined compositions arrange complex color harmonies that emerge from intuition open to chance. Kat’s artwork has been shown in numerous juried solo and group exhibitions, one juror praising its “jewel-like quality.” Within the last 15 years she has won many awards for paintings (including the Winner Circle Award at the Westport Arts Center as selected by the Whitney Museum Director) and been included in many juried exhibits, and presented numerous solo shows in the Northeast. Her work can be found in private collections throughout the U.S. and Europe. Star Li was born in 1986 and has attended school in Japan, Korea, Canada and the U.S over 10 years. She majored in Biology, Commerce, Film Making and Painting during these years and finally got her Master of Fine Art degree in San Francisco. She is now living in New York as a professional artist. Born in Switzerland, I grew up fascinated by paintings by Hodler, Segantini, Valotton, Amiet, Giacometti and others. Unfortunately, my art teachers were totally taken by the abstract minimalism movement of the time. They discouraged me from pursuing my love of strong, realistic imagery, the organic and narrative quality of my work. So I resorted to photography for many years. In the 70’s I moved to the USA, returned to painting and never stopped. I immersed myself in images of organic forms...the Pear, the female figure, the Cone Flower. During the past three years, I took a leap of faith and started painting small abstract works inspired by nature, gardens, walks in the park, color and light. 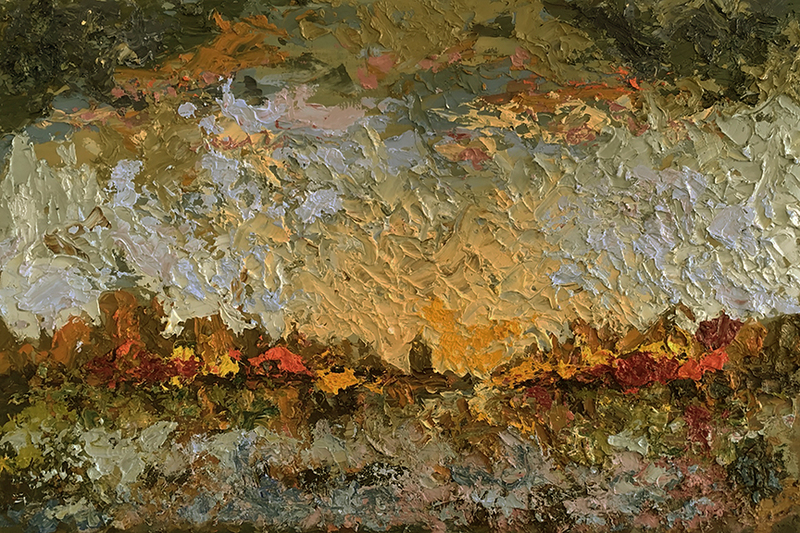 It has been very exciting to work with thick layers of colorful paint applied with palette knives. Ironically, it is my reluctance to waste paint that lead to this transformation. For a long time, after a day’s work on a large painting, I would make a quick small painting or sketch with the leftover paints on my palette. I have also used the iPad with various painting Apps to further my exploration of abstract images. The only problem with the digital media is that the images have to be reproduced on either paper, canvas or metal which result in something very different from an oil painting. I am still searching for the ideal way to reproduce them. The two abstract painters who inspired me greatly for the work on exhibit are Alma Thomas and Joan Mitchell.